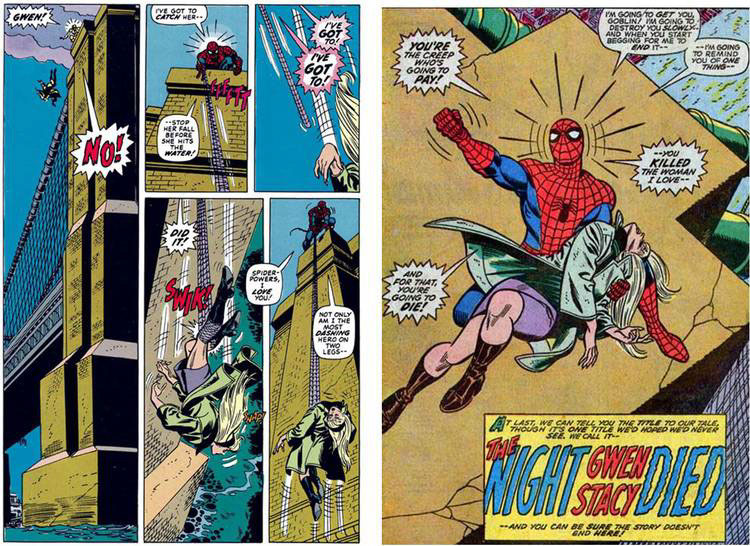 In one of the most famous comic book panels of all time,Â Gwen Stacy loses her life to the oppressive pull of gravity. Attempting to save her with a lifeline of web after she fell from top of a city bridge,Â Spider-Man loses the love of his life does catch her, but the sudden deceleration snaps her neck. But we've gone back and evaluated this scene like science-whiz Peter Parker would, and now we wonder: would Stacy really have become one of the most infamous comic deaths?In my latest episode of Because Science, we are recreating the circumstances on Gwenâ€™s grand goodnight, except this time we will be evaluating it using math, science, and engineering. If Spider-Man were using a material like real spider silk in his web shooters (why wouldnâ€™t he be? ), would there really be a sudden, neck-snapping deceleration? We know enough about the material that we can calculate stretch, strength, and g-forces. [brightcove video_id="5858923462001" brightcove_account_id="3653334524001" brightcove_player_id="rJs2ZD8x"]I know the death of Gwen Stacy is canon, and no number of numbers can save her. But this analysis might make Peter Parker proud. After you watch the new episode, check out my last video on Fallout's "mini nukes" actually exist, buy a Because Science shirt, mug, hat, or collectible pin, and follow me on Twitter or on Instagram to give me a suggestion for the next episode. Want Because Science even earlier? Subscribe to Alpha for access to the show two full days before anyone else.